↑ This number was derived from the rivers list published in Atlas Canada by Natural Resources Canada. ↑ «USGS Water Resources of the United States: Boundary Descriptions and Names of Regions, Subregions, Accounting Units and Cataloging Units»։ United States Geological Survey։ 2007։ Արխիվացված օրիգինալից-ից 2012-06-17-ին։ Վերցված է 2008-09-16 Sum of Subregion 1704, Upper Snake, Subregion 1705, Middle Snake, and Subregion 1706, Lower Snake. ↑ Willamette River Basin, Portland Bureau of Environmental Services (2008). Retrieved on 2008-09-16. ↑ The Rivers, Balance of Power: Hydroelectric Development in Southeastern British Columbia; Touchstones Nelson: Museum of Art and History. Retrieved on 2008-09-16. 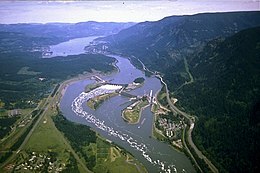 ↑ Calculated by summing subbasin sizes listed in Lower Columbia Tributaries, Northwest Power and Conservation Council; and Toutle Management Plan, Northwest Power and Conservation Council. Retrieved on 2008-09-16. ↑ Water Data Report WA-05-1, chapter Okanagan River Basin. Retrieved on 2007-04-20. ↑ Upper Columbia Subbasin Overview, Section 29, p. 8; Northwest Power and Conservation Council. Retrieved on 2008-09-16.